Charlene Minor drives an ELF in her job as sustainability coordinator for the Town of Davidson. Alternative fuel vehicles are showing up more often on the roads these days, as some drivers look for eco-friendly ways to get around. Hybrids and electric cars are fast enough for the highway. But what if you want something simpler? I recently had a chance to test drive an ELF - an electric assisted bicycle made here in North Carolina. 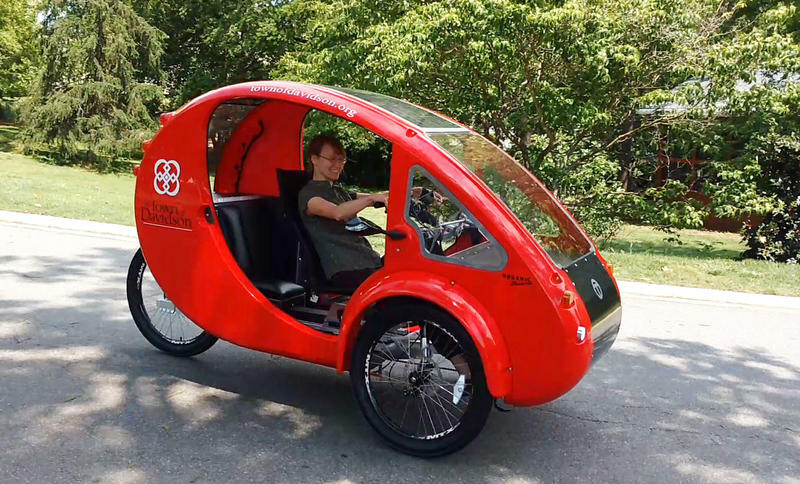 ELF stands for Electric, Light and Fun -- three words that describe the three-wheeled vehicles made by Organic Transit in Durham. These sleek, recumbent bicycles -- the kind you sit down to ride - come with pedals, handlebars and hand-brakes, as on any bicycle. But the ELF also has a lightweight shell with solar panels on top to charge a battery that gives you a little extra boost when you need it. The electric motor kicks in as I drive the ELF up an incline. It's really nice to have that extra boost. You can drive the ELF without pedaling, but the exercise is half the reason to choose a vehicle like this, says Organic Transit founder Rob Cotter. 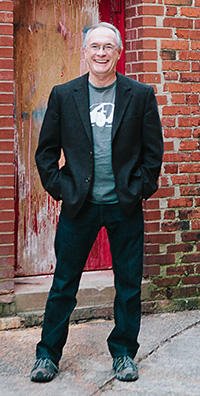 “A lot of people are becoming very cognizant of that health benefit, the economic benefit, the environmental benefits. And then, it's just a lot of fun to be riding in ... it's kind of like going on vacation every time you hop in,” Cotter says. Years ago, Cotter worked on Porsche and BMW race cars in California, where got interested in ultra-efficient and pedal powered transportation. The idea for the ELF came to him about eight years ago, when he was consulting for New York City on bike sharing. “It made me realize that if New York City is putting in nearly 300 miles of new bike trails, there is a market for a bicycle type of vehicle that can give people protection in the weather, get them up big hills easier, carry a passenger and groceries, and not have to pedal if they don't want to get all sweaty at that moment,” he says. After a few years' development, Organic Transit raised about $250,000 through a crowd-funding campaign, and began manufacturing and selling ELFs three years ago. Cotter says about 700 are now on the road, including the one I tested, owned by the Town of Davidson’s parks and rec department. Davidson sustainability coordinator Charlene Minor says her ELF replaced an under-used truck. ELFs are made by hand at Organic Transit's Durham factory. They weigh about 150 pounds, but can carry 350 pounds and pull a small trailer. The basic model starts at $7,000. They can go 20 miles an hour on battery only, or up to 30 if you pedal along. Depending on the battery size and whether you pedal, they can stay charged for 50 to 100 miles. Visiting nurses in Montana use them for house calls. So do campus security officers at Duke University. Some owners use them to commute, others as small food trucks. Minor says she uses the ELF to get from her office to Town Hall, go to appointments, and to pick up supplies for department events. As for the ELF’s future, Cotter hopes it will continue to catch on. He expects to sell 1,000 this year, but he’ll have to figure out how to speed up production of this hand-built vehicle to be sustainable. “The challenge is always scaling,” he says. “These are hand-built solar vehicles, made in the U.S., not available ... anything like it anyplace else in the world. To say that doing this is a challenge would be an understatement." Organic Transit doesn’t do much marketing. Cotter says all his sales come via the Internet or telephone.